Ride the Warm Pacific Waves Just Off the Coastline! 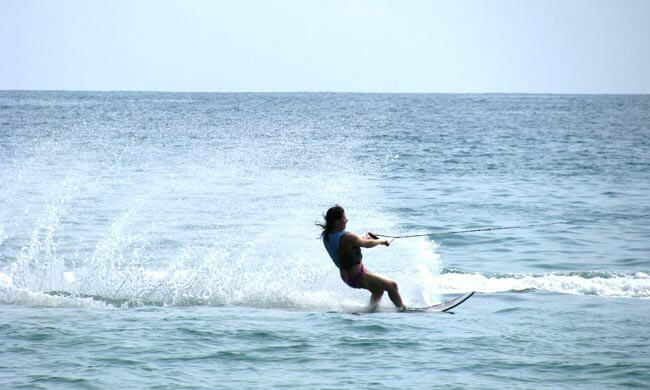 If you are looking for water skiing Costa Rica, this is your adventure. Ride the warm Pacific waves just off the coastline of Manuel Antonio! This 30-minute or 60-minute ride through the wave is a great workout and can accommodate any skill level. Whether you’re taking up wakeboarding or water skiing for your first time on this trip to Costa Rica, or are a pro at carving up the waves in a tropical setting, this spin in the Pacific is both fun and memorable! After your time in the water, stick around at the beach and enjoy some more fun in the water and sand or take advantage of the transportation back to your hotel. If you stick around, boogie boards are included! Included: Transportation from/to your hotel, equipment, safety lesson, bilingual guide. What to bring: Camera, sunscreen, insect repellent, change of clothes (if preferred), towel. What to wear: Swimsuit, sandals (or water shoes).